The 3-1-2-1 Diet was created by Dolvett Quince, a celebrity trainer best known for his appearances on The Biggest Loser. 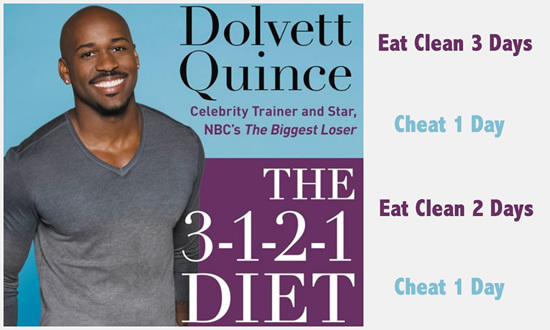 In this book, Dolvett Quince reveals his unique approach to dieting called the 3-1-2-1 Diet. This program aims to trick your metabolism and to produce rapid weight loss. Dieters can lose up to ten pounds in 21 days on his plan. Dieters don’t have to give up any of your favorite foods. The basis of this diet plan is Dolvett’s clean and cheat method that avoids dieters eating the same amount of calories every day. Eat clean for 3 days. Eat clean for 2 more days. Enjoy a reward meal of your choice on the 7th day. This method confuses the body by manipulating its natural tendency to slow metabolism when calories are reduced. The body responds in a positive way that helps people lose weight faster. Since dieters won’t feel deprived it also makes it easy to continue with the diet for long-term weight loss success. Quince says one of the most important factors to success is to start your week by eating clean for three days. He explains that eating clean means to base your meals around lean proteins, green vegetables and smart carbs. You should have three main meals and two or three snacks each day. Quince reminds dieters to be mindful of portion sizes for optimal weight loss results. You will limit your carbohydrate intake to some degree on this plan. However when you do eat carbs it is important to choose them wisely. Sweet potato vs. mashed potato. In general you want to favor more colorful carbohydrates and stay away from all white, starchy foods. No foods are off-limit in The 3-1-2-1 Diet. Two days each week you have the opportunity to indulge in your favorite treats. In fact, Quince says that cheating is the key to success. It satisfies cravings, makes it easier to stick with the plan, and boosts metabolism. Chicken breast, turkey bacon, lean beef, salmon, egg whites, brown rice, oatmeal, whole-grain bread, almonds, string cheese, spinach, green beans, asparagus, broccoli, zucchini, mushrooms, sweet potato, avocado, berries, oranges, kale chips. The 3-1-2-1 Diet advocates a combination of high-intensity cardio and strength training four to six days a week. Going back and forth between cardio and weights confuses the body and helps sculpt a lean, muscular physique. Dieters should rest for at least one day each week to allow their body to heal and recover. The 3-1-2-1 Diet: Eat and Cheat Your Way to Weight Loss–up to 10 Pounds in 21 Days retails at $26. Prevents plateaus and boosts metabolism. Does not require giving up your favorite foods. Cheat days make it easier to stick with the plan over the long term. The 3-1-2-1 Diet includes meal plans and recipes. Workouts are time-efficient and effective. Some dieters may find it difficult to control their calorie intake on cheat days. Requires monitoring portion sizes on “clean eating” days. Not all dieters will achieve the promised level of weight loss. Workouts may be too strenuous for dieters who are currently physically inactive. The 3-1-2-1 Diet claims to boost metabolism and produce rapid weight loss by alternating “clean” and “cheat” days. This method confuses the body and avoids weight loss plateaus that commonly occur with low-calorie dieting. It also reduces cravings and makes it easier to stick with the diet over the long term. To be successful on this plan it is necessary to monitor portion sizes on “clean” eating days. However, it just as important to be mindful of calorie consumption on “cheat days” to reap the most rewards.